caIn't believe the fact that it has been 3 weeks since I posted here. The reason is nothing else but holidaying/relaxing at mom's place. Brother and sister are here to add to the fun and time flies! Ignoring the heavy showers, sister and me strolled along the streets enjoying shopping. Under the same umbrella, literally drenched, we loved the feel of rain and buzz of the town after a long time. Bliss! 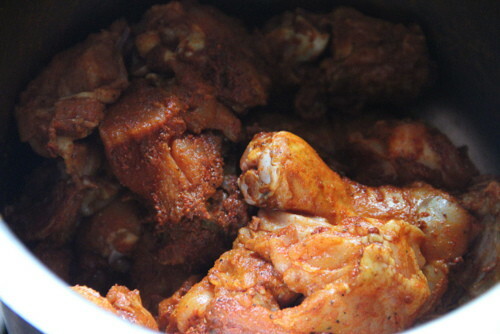 I had been eyeing and trying the chicken curry recipe from Ranji's for quite a long time. 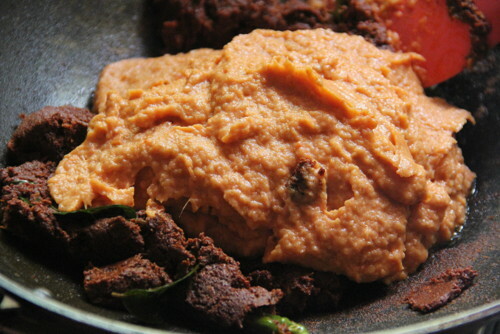 The catchy part of the recipe was the grinding of the masalas. I could guess the aroma of the curry! I couldn't wait to try the recipe making a few changes converting it to the flavourful Kerala Chicken Curry! Marinate chicken with the ingredients given in the "to marinate" list. 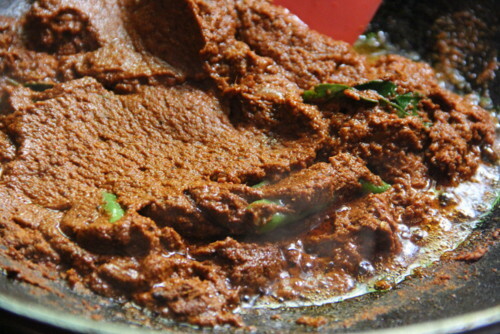 Grind masala. 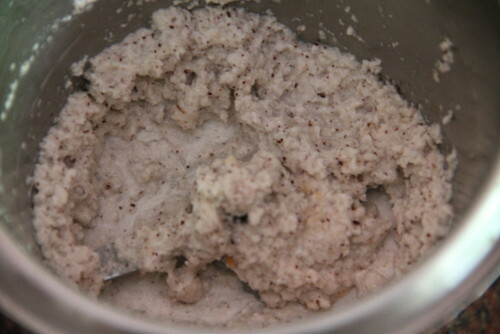 I used the ammikkallu for the traditional touch and grinding the hard textured spices to a smoother paste. 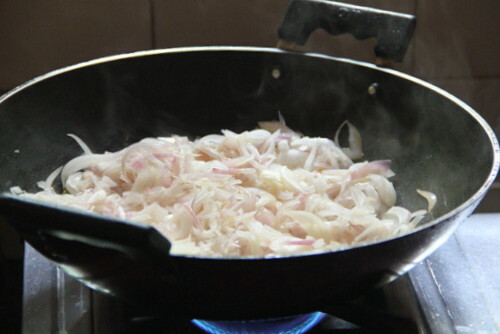 Heat 2-3 tbsp of coconut oil in a wide kadai and sauté the sliced onions till translucent adding half a tsp salt. 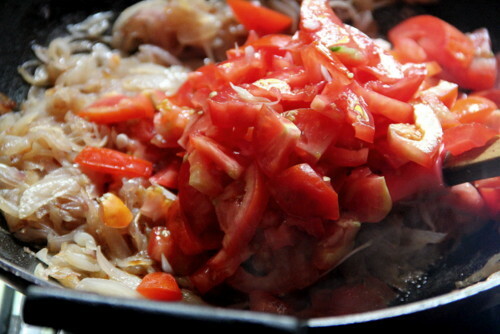 sauté along the tomato slices. 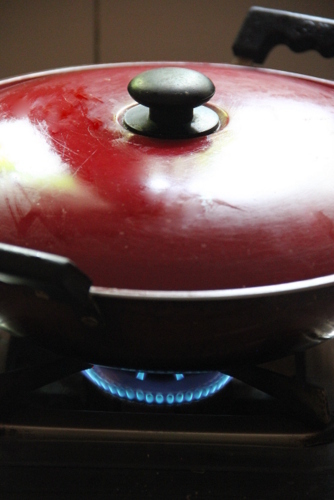 Turn off when it cooks and turns to a mushy mass. followed by the ground masala (the raw ingredients given in the list). 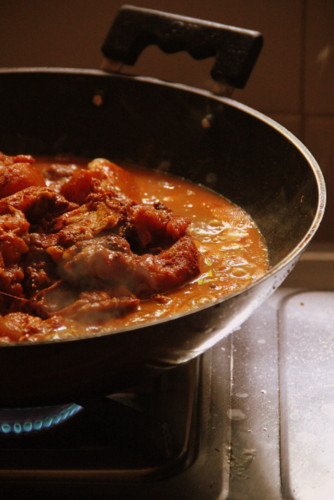 Sauté till the raw smell disappears and the aroma of masala spreads around. 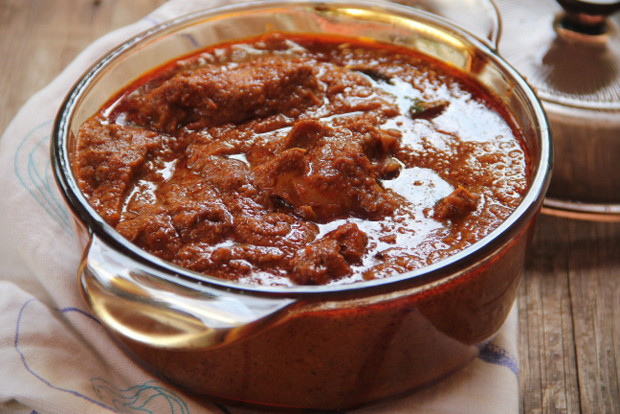 You may need to drizzle a bit more oil if you aren't using coconut oil, or even otherwise, take care not to burn the masala as it tends to stick to the bottom of the pan. 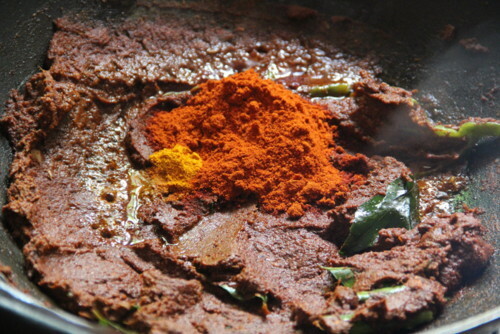 While it turns dark brown in colour, add the 1/2 tsp turmeric powder and 2 tsps chilly powder. Dump the chicken pieces carefully when the gravy starts simmering. 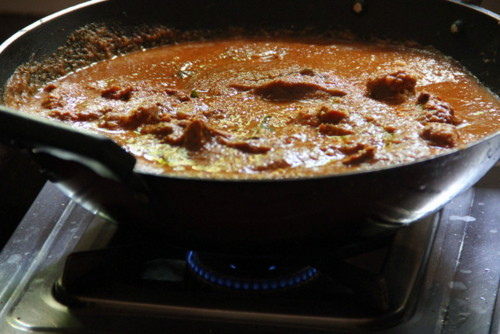 close the curry with a lid.The gravy splutters and it is always safe to close the curry allowing to simmer further. 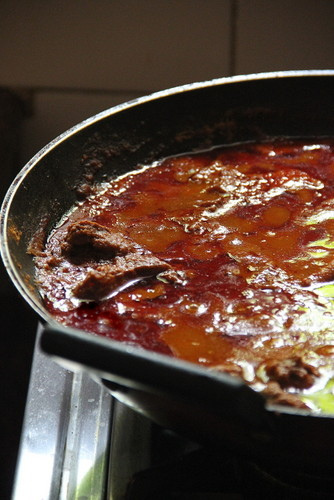 After 5 minutes add the ground paste to the simmering curry. 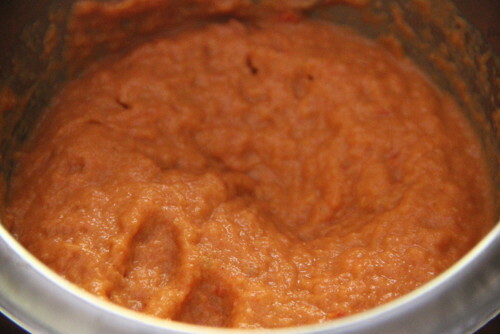 Combine gently.Let is simmer again in the closed pan until the pieces turn soft and cooked. Check salt again if needed. 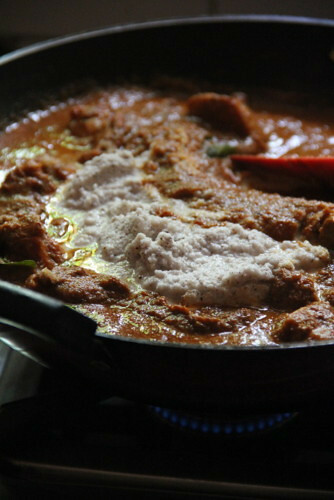 Simmer until the pieces turn tender.You will find oil separating on top, when the curry attains the right consistency. Not too thick nor watery. 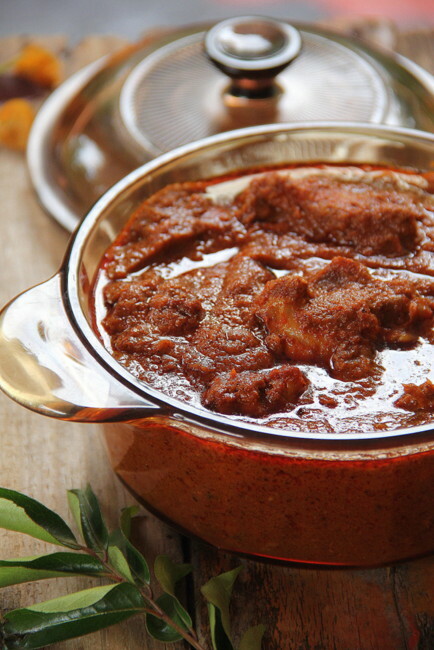 delicious curry... love the masala part..
Amzing & finger licking good!!!! The masala is so flavorful!!! Glad to have u back :) And think this same masala would go for egg curry too?? Yeah, Prathima it will certainly work for egg curry! but take care to reduced the amt of spices and powders as eggs really dont absorb the heat and flavour of the gravy. I remember seeing this in her place a whole ago too. But i think i love the look of yours more as this one is bright red, wish i hade this right now. Sounds bliss the time spend with your sis. Bharathy..I need some clarification.Did u skip adding red chilly powder--3 tsp in the ground masala? Or is it extra as kashmiri chilli powder is not spicy. I had been a little careless while editing as I published in a haste yest'day evening, so had left typing the final seasoning ing :) had noted down the amounts while preparing. As the curry was towards the hotter side, had decreased the amt of chilly powder. 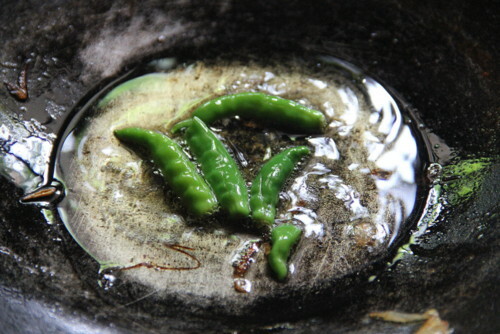 In fact it is used for marination, grinding and seasoning!! 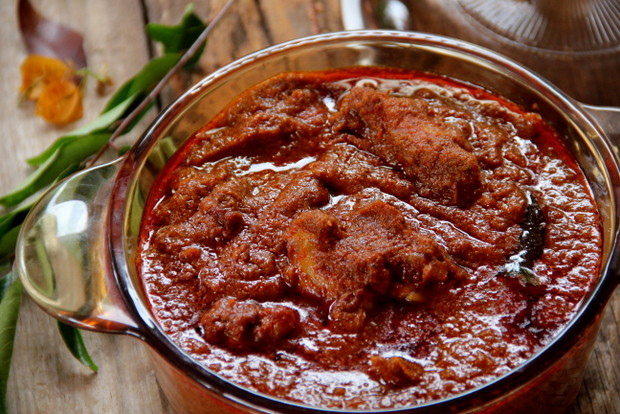 Omg, curry looks absolutely irresistible,wat a colourful and fingerlicking chicken curry..
Bharathy, the recipe is very similar to my Chettinadu/Karaikudi chicken curry that my hubby and daughter enjoy here. The clicks are exceptional. Makes for a very tempting look. Cheers for sharing. What an amazing recipe! I am a vegetarian, who has never cooked chicken. This recipe was my first ever attempt at the uncharted territory. I was really apprehensive about the outcome. .. but it was such a hit with my family ! My hubby actually said that it was much better than anything his mother had ever made ( now that's very very high praise indeed ) . Thank you so much for such a detailed, well written by photographed recipe . You now have an ardent follower of your blog! Keep up the good work! Wow ! 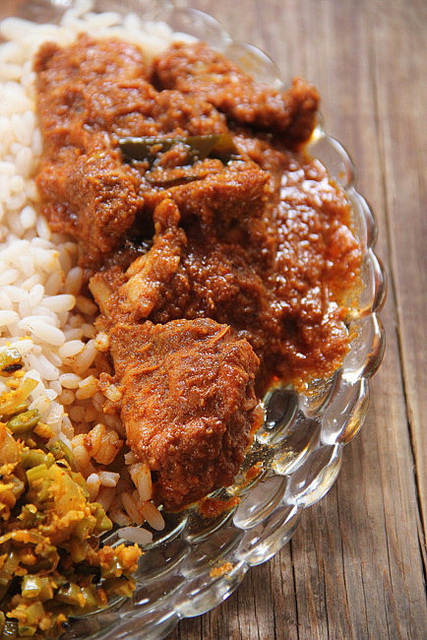 This curry looks so so so yummy :)I am definitely trying this. Love your blog. i tried this recipe, it is so delicious. This is surely an easy to follow recipe. Yes, it does consume time but it's all worth it. The taste and the creaminess of the dish is really worth it. I so love this and going to share to my Indian recipes pinterest board. Cheers! Hi Bharathy, I'm planning on making this curry today, but before I get started I had a question: Right at the beginning, under "Ingredients" you say, chicken, onions(5) and tomatoes (4). And then again under sauté and grind, you've got onions and tomatoes again, I'm not sure why they're mentioned twice, or am I missing something? I've made your meen peera with chemeen and it was absolutely delicious! This is only the second recipe I'm trying off your site, and hopefully it turns out as well as the first! Thanks a ton for taking the time and effort to guide us in the kitchen. Hello..I have the same question. Do we have to use in TOTAL 11 onions and 8 tomatoes? So the chicken curry is just lip smacking!! Loving it!!! what is an ammikkallu ? 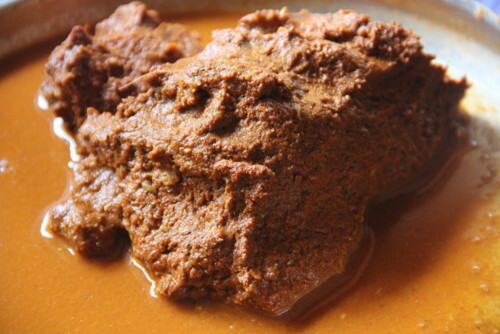 I am a Malayali and truth be told, this if the most awesome recipe I've ever tried. My family just lovvved it. Definitely part of my repeat preparations. Hii... I made this curry and everyone at my home loved it!!! I am from Kolhapur, Maharashtra and we are a big fan of non veg food. We had never tried South Indian flavours in the non vegetarian dishes before but now after tasting your dish my entire family has become a huge fan of South Indian non veg food. This is the second time I am making it. Only thing I wanted to ask is, last time when I had made it I remember putting deep fried curry leaves in the gravy. And I don't see it anywhere right now? Anyway the curry has become amazing as usual and everyone is loving it. 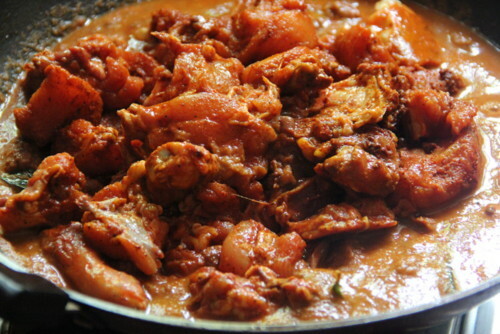 Hi, right now, the chicken curry based on this recipe is simmering on the stove. 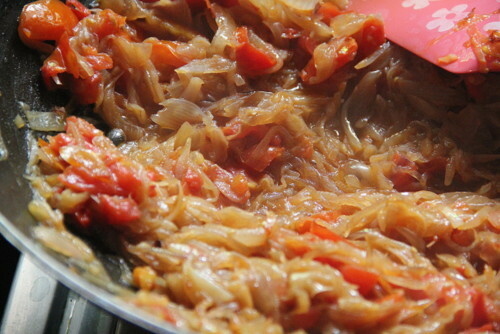 However, you had given under "ingredients Big onions- 5, medium sized Tomatoes- 4, sliced. Again in "To sauté and grind; for the gravy" Big Onions - 6 medium sized, sliced thin lengthwise and Tomatoes - 4, sliced thin. Are they really to be used twice?